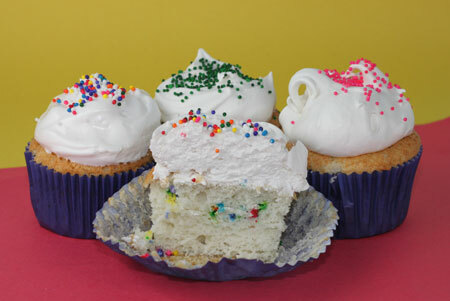 If you find yourself with six egg whites and don’t know what to do, Angel Cupcakes to the rescue! I made these after baking the Cook’s Illustrated Wicked Boston Cream Pie. Because I was anxious to see how the recipe would turn out, I made the cupcakes the next day, but you can also freeze the egg whites and thaw them when ready to use. In my experience, thawed-from-frozen egg whites whip up just as well as fresh. But back to the cupcakes. These are a lot like actual angel food cake, but with just enough butter to make them slightly denser and less airy. Plus, you don’t need the angel pan! For the icing, I used my favorite 7 Minute recipe and it worked perfectly! The cupcakes are so good you won’t believe they’re low in fat. I’m estimating about 3 grams per cupcake, but I’m not a nutritionist and didn’t do any kind of thorough analysis so don’t rely on that as nutritional advice. Just enjoy the cupcakes and know you could do a lot worse. Oh, and the sprinkles are optional. I threw some into part of the batter to make my own confetti-themed cupcakes, and I also sprinkled more on top. Here’s a picture of the cross-section. I like 7-Minute Icing because you can pile it on very high, plus it gets all nice and crusty after it sits out for a while. Sift the cake flour, salt and baking powder together and set aside. In a microwave-safe measuring cup, combine milk and butter. Microwave one minute or long enough to scald milk and melt butter. You may also do this over the stove. Beat the egg whites in a large bowl until foamy using an electric mixer. Add cream of tartar and continue beating on high until whites form stiff peaks. Set aside. In a mixing bowl, combine the hot milk/butter mixture with the sugar and beat on low speed. Add the flour mixture and the vanilla and beat until smooth. Gently fold in part of the egg whites to lighten the batter, then fold in all the rest. Divide evenly among the cupcake containers filling about ¾ of the way full. Bake on center rack for 20 minutes. To make the icing, combine all ingredients except vanilla in a metal bowl set over a pan of boiling water. You want it about 2 inches from the water, but mine is almost always closer and I never have a problem. If you have one, you can just use a double boiler. Beat on high speed of an electric mixer for about 7 minutes or until mixture is thick and spreadable and peaks have formed. Remove from heat and beat in the vanilla. I’ve made these twice now, and they are my new favorite cupcake recipe. Absolutely perfect both times. The fact that the cupcakes have 2 tbs of butter gives them so much more body than typical angel food cakes…yet they are still low in fat. Thanks for such a great recipe!!! I think the 7 Minute Icing would be great for your cupcakes. Three days early is kind of a long time in my opinion. What you might consider doing is making the cupcakes three days early, freezing them, then doing the frosting the night before. Also, I found my frosted cupcakes tasted great on Day 2 after being sealed in a plastic container. If you leave them out, the icing gets crusty, but when you put them in a sealed container the icing gets soft again. So if you want to keep them soft you should probably put them in a sealed container of some sort. I am going to make some cupcakes for a baby shower. I was thinking chocolate cupcakes with blue frosting. Do you think this 7 minute frosting will be a good choice? Also, how long can you keep this frosting in the fridge? I want to make the cupcakes three days early. Thanks! Was wondering the other day if I could do angel food in cupcake papers. Mine was a box mix though – I have never tried to make one from scratch. I’m thinking that will change now. And, I LOVE the sprinkles in the batter. One variation I do with a box mix, especially in the summer, is add a small can of crushed pineapple, juice included, instead of the water. You can “ice” with cool whip, serve it on the side or just leave it plain. Very good and very refreshing. I think angel food cake will work in almost anything that has pretty straight-up sides and isn’t too wide. I’ve made it in loaf pans in in cupcake tins and both have worked well. I just think it needs something to “grip on” to rise and if you did it in anything too wide, the middle would likely not rise or sink really badly. I didn’t realize angel food could be in any other form than tube. I much prefer it this way, and the frosting looks to-die-for. Thanks Anna! Never had angel food cupcakes, but they look delicious!….My mom’s favorite cake was angel food so we had it alot growing up. They are kind of healthy too since no egg yolks and hardly any fat!! I agree–tube pan angel food cake is the best–my grandma always had one for dessert and it seems like it always had pink frosting on it. I need to get a tube pan. These were my FAVORITE growing up (my sunday school teacher used to make us a small cake of this for our birthdays) and I have had a hard time finding the right cupcake case for them (like angel food but not exactly) so I am completly stoked to try this recipe! Thanks Anna! I’m partial to icing/frosting, and this looks like a great ratio of icing to cake. Yum! Katrina, our grocery store sometimes sells angel food cakes in loaves, so I know you can do it in other pans. I always feel like I need to do it in a tube pan, though….the way my grandma did. I liked that these cupcakes weren’t actual angel food, but close. They had the same flavor, but not as many air bubbles. Jennifer, the good thing about 7 Minute Icing is that if you screw it up you haven’t wasted much money. It’s a good recipe to master. Stacie, thanks. I was going to pipe it, but realized that if I just glopped it on it still looked good. Plus I was out of decorator bags. Katy, the reason I listed it twice was because I didn’t really measure it accurately. I estimated and just threw some in. Start with 1/4 tsp and add more if you feel like you need it. Also, the brand of vanilla will impact that. Anna, that’s really good to hear. If it were up to me, I’d bake brownies and chocolate chip cookies every day, so I have to work hard to find other things that are a) sort of interesting and b) I’d want to eat. Seriously, I’ve been wanting a cupcake recipe like this. Angel food is yummy, but too much trouble. Holy freaking deliciousness. Why do cupcakes always look so gorgeous when dissected? Science. That’s why. Yum! I’d love to make these this weekend for my husband’s birthday (he’ll be all of 22 years old… lol!). 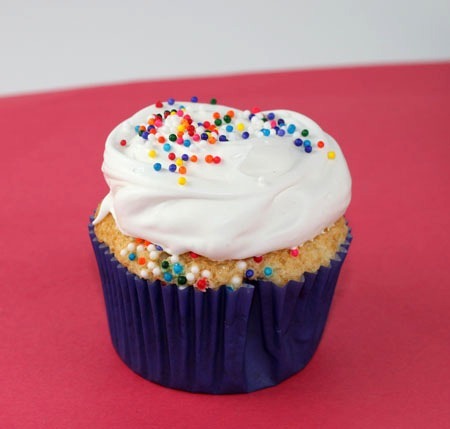 One question: the frosting ingredients list vanilla twice (1/4 tsp and 3/4 tsp) – which is the correct amount, and should the other one be another ingredient? Thanks! These are next on my list to make! I love cupcakes and really like the look of the frosting in your photos! Those look good! I love how light and fluffy egg whites can make baked goods. So much fun to bake with. Those look really delicious and I’m in the mood to make cupcakes. I’ve never made 7-minute icing, though, so I’m a little nervous about that. Yum! I just had one little egg white and made some meringue cookies with them that were SO good. I was just working on a post for them. And my SIL just asked me if you can bake an angel food cake in something besides a tube pan the other day. She did it in a 9×13 pan and it worked, but I think cupcakes would be even better–especially for individual freezing.